(Editor’s note: I’m still uploading photos and video from yesterday’s American Airlines press conference, so please come back a little later today to read my related post. I’ll be giving away some goodies from the Swag Bag!). Klout is the online service that attempts to measure a person’s online influence. They analyze content from social networking sites like Twitter and Facebook, and based on how people use and share that content, they assign an influence score (Seth Stevenson at Wired wrote a great article about the topic last month). 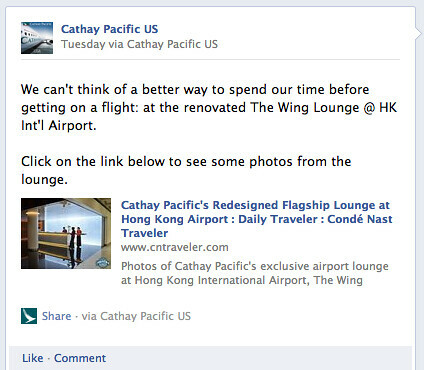 Today we’re announcing a great partnership with Cathay Pacific Airways that makes the benefit of taking your Klout with you even more obvious. Starting today, San Francisco International Airport (SFO) visitors using the Klout for iPhone app need only show a Score of 40 or higher to enter the Cathay Pacific First and Business Class Lounge. Previously, the only way to see the inside of a Cathay Pacific Lounge was by holding a First or Business Class plane ticket. Now, Klout unlocks access to this amazing experience. This applies to any visitor traveling through the “A” boarding area at SFO’s international terminal, even if they aren’t a Cathay Pacific passenger. If you don’t have a Klout score, you can sign up with your Facebook or Twitter identity. After you’ve created your profile, install the Klout iPhone App, and then head to Cathay Pacific’s First and Business Class Lounge located on Level 4 of the International Terminal.